It's easy to save 50% off for Vegas Gone Country. Just book online here today! See the most country performers in this one of a kind show at V Theater. No coupon code needed to apply discount to order. Rates from $30 before fees/taxes. Country music Vegas style, the only country music tribute show in Las Vegas; Vegas Gone Country is the place to be for fans of iconic country music. 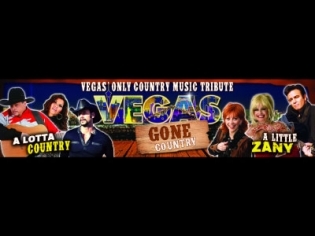 Kick up the dirt, stomp your feet and sing along to the impressions of artists like Reba, Johnny Cash, Miranda, Faith, Tim McGraw, Willie Nelson, Dolly, Garth and many more at Vegas Gone Country. This show is a Vegas spin on the Johnny Cash show and Hee Haw. The show includes comedy acts and live music with combinations of new and classic country hits. The rotating cast of iconic country stars will make each show a unique experience. Vegas really does know how to perform tribute acts and this show is no exception. Grab your seat for a rip roarin’ good time.